This question was triggered in my mind by hearing an interview with Steven Pinker. There was no doubt in his mind! Our impressions of violence are determined by media reporting, which concentrates on violent acts. There is always newsworthy violence going on, so our impression is of unrelenting violence in society. However, Pinker looks at the statistics showing the incidence of death at the hands of another human being over time. This was around 300 per annum per 100,000 population during the Second World War, he said. Since then it has declined to less than one, and continues to fall. He also quoted impressive trends over the centuries. It turns out that Pinker in 2011 published a whopping 800+ page book on the subject called The Better Angels of Our Nature: Why Violence Has Declined which is treated extensively at Wikipedia. There is also a long interview on frequently asked questions. To cut to the chase, there is a very interesting article by Philip Dwyer at The Conversation, with the important insight that violence is a human construct; what counts as violence varies over time and place. I’m reminded of the notorious Adelaide judge who referred to a case of sexual violence with marriage as “a little rougher than usual handling”. Dwyer also points out that while homicide stats in Australia have been steady for decades, assault is increasing. have dropped dramatically from 100 for every 100,000 people in the 13th century, to ten in 100,000 by the middle of the 17th century (although it was that high in the United States only a few years ago) to rates of around one in 100,000 people in most Western countries today. The reasons for this deserve analysis, which Pinker attempts. His six trends, five inner demons and four better angels are interesting but must in the end be speculative. The IEP’s Global Peace Index is researched by an international panel of experts and complied with data collated by the Economist Intelligence Unit (EIU). The GPI ranks 162 countries, covering 99.6% of the world’s population. The index is composed of 22 indicators, including a nation’s level of military expenditure to its relations with neighbouring countries, as well as the percentage of the population held in prisons. Thus homicides are but one of 22 indicators. They note a 60-year down trend for violence since World War II, but a corner was turned in 2008. Each of the last seven years was more violent than the one before. The 10 most peaceful countries in order, are Iceland, Denmark, Austria, New Zealand, Switzerland, Finland, Canada, Japan, Belgium and Norway. Australia comes in at 15th. 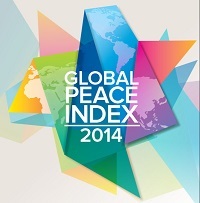 Europe is the most peaceful region occupying 14 of the top 20 places. It would be interesting to analyse why Italy at 34, the UK at 47 and France at 48 do so much worse than the rest of Europe. The United States is near the middle of “medium” occupying 101st place in the company of Haiti, Benin, Angola and Kazakhstan, a distinctly third world positioning. Amongst the OECD countries only Turkey at 128 and Mexico at 138 come out worse. South Korea is at 52, but as far as I can see all the other OECD countries are in the top 50. The worst in order (worst first) are Syria, Afghanistan, South Sudan, Iraq, Somalia, Sudan, Central African Republic, Democratic Republic of the Congo, Pakistan, North Korea and Russia. violence is not a purely innate phenomenon and that it is also a question of culture and education. Cultural factors can play a determining role in how aggressive or violent a society is. Aggression, which is often mistaken for violence, can be contained by society and can be channelled into more positive activities. In this, the role of the state and local community is fundamental. In countries where citizens identify with their local communities and where government is responsive and popular, levels of violent crime are relatively low. He also says that violence is largely a thing for males aged 20 to 30. It is said that the brain connections between our emotional and rational faculties only mature at age 24, plus or minus 5 and a little earlier for women than men. Peabody Research Centre have done a study which found that religious hostilities reached a six-year high in 2012. However, I haven’t seen enough of the study to get a feel for what it is really about. Is the end of violence possible? No, but cultures and attitudes can be changed by focusing, above all, on education, positive outlets for aggression, and community involvement.